If you’re in Las Vegas and your FitBit buzzed mid-morning, it probably wasn’t a mistake—Monday was a very busy day at the 2015 IPI Conference & Expo. Soumya Dey, director of research and technology transfer, Washington, D.C., Department of Transportation. Tishaura Jones, treasurer, City of St. Louis. Steven Nerayoff, CEO and founder, CloudParc. Living up to its television quasi-namesake, Park Tank was informative, interactive, and super fun! The grand prize winner was Smarking and the people’s choice winner was also Smarking. Look for more on this in the September issue of The Parking Professional. Other highlights from Monday included the always-popular, industry-segment Shoptalks, which brought together professionals from airports, universities, municipalities, and other specialized parking operations for learning, ideas exchanges, and networking. Yesterday also marked the first day of education sessions: six tracks of presentations plus fast-paced and interactive Ignite sessions that are always a hit with parking professionals. The evening was spent in old Las Vegas at the Mob Museum for the Opening Meet & Mingle event—always a crowd-pleaser and networking highlight—and a great night exploring the Fremont Street district and its restaurants and entertainment. We hope you charged those activity trackers again last night because there’s much more on tap today. 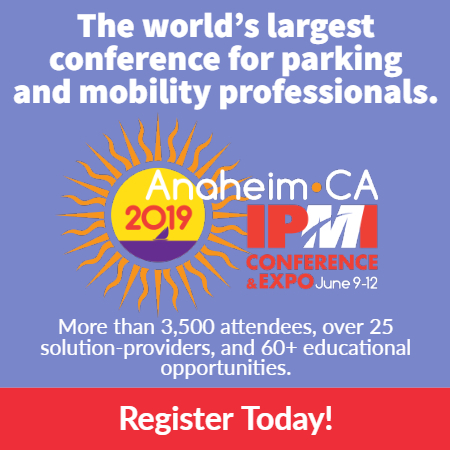 The world’s largest parking Expo opens at 11:45 a.m., immediately following the Opening General Session with keynoter John Martin, the Professional Recognition awards; Chair’s Awards; and Lifetime Achievement Awards. More education and networking follows. See you there!